We live in a connected world, for sure. Even those who don’t want, won’t escape to changes, they feel, live or suffer. When, how, which ways? Where from, why? New generations can explain because they live in and are confronted to old school and traditional rules, they even sometimes, can’t understand. Codes, habits, rules…How imagine the world in such situations and understand the wealthy mix we can draw benefits from and hold the main direction to sustain the daily life? I was thinking of writing in last centuries: from stones, to paper, wrting styles and ink, and printers…then digital writing and contents…Such situation meant slow shifts (as we stare technology revolutions go faster and faster), but we will be confronted in a future, where nobody will write anymore, one day…because of the huge invasion of digital supports, we won’t be using pens, stencils and so on, anymore…And at school, nobody will learn writing anymore, because “use” would have disappeared? It’s part of something that hurts me in fact…Living without knowing any letter or figure to write, because keypads or vocal systems would replace them…? Competition insights, sourcing innovation, ideas or best practices? 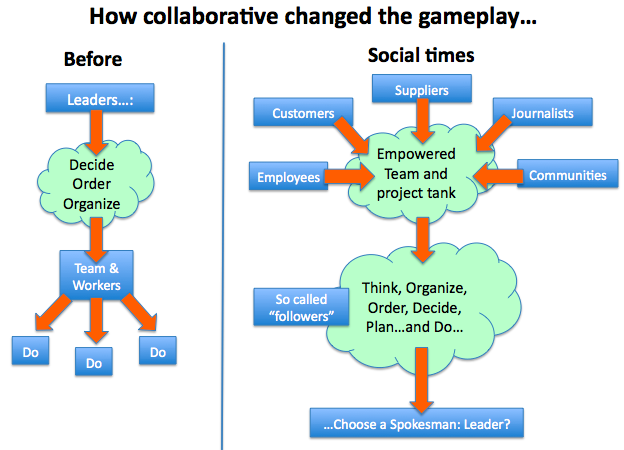 The Impacts on collaboration and collaborative circles? The way the world is connected and then, how to use marketplaces to reduce time, effort and delay on sourcing information? How to manage resources (people, time, schedules and machines) in a connected world? HR implementation with social networks (pro and personal platforms, dealing with synergies)? Communities, branding, e-reputation: how to solve the equation of truth and trust? Marketing rules and new ways of improvement: who is the product manager, now? Seeing Sony, including some browsing services as Google or Youtube browsing and so long, we just wonder if, filling tv with services is sufficient enough to modify behaviors, to complete convergence in “social” trends for TV. I already wrote on the subject and there’s obvious limits by now. But the increasingly involvement of people in creation (acting, doing something online, chatting, creating videos, music, art design…) is real, and boosts on the “pc-like” screens. Seems that influenced (target), now influences contents and services too: TV media always considered as one way media (one-to-many) gets wings: the ability for modern TV to be plugged on audience’s desires is a bright step toward customer relationship management. As many shows has developped licences, goodies…temptation is straight to adress the audience with added revenues like these sources. 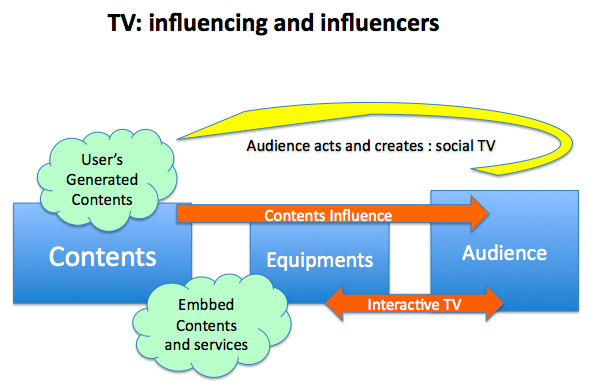 The diagram shows us that a passive audience (influenced) become active through interactive TV and contents “home-made”, that can fill the timeline. Is TV becoming a marketplace with collaborative (in a group idea) ideas and community, I don’t think yet, keeping a private household network and enable only personal communications. But the commoditization of uses on other screens (laptops, PDA, pc) could make an envy to transform our old TV device: game box, that can be considered as individual act on screen, already did invade TV. Social TV: more TV or more social? TV always used to be a collective pleasure. Remember how families met around the next big thing, the prime-time event that grew up our minds and entertained the bulk. Interest rose with the whole offer: more colors, more channels, more catchup broadcast. Technology supposed to be a strong ally to stream these big events and used to get the best off them, threatened theatre, sports spots and children movies. And brought lots of opportunities in consuming TV: recording, ads shifting, original sounds and voices, quality of sound and high definition for picture. As I’ve been involved in several business, including TVs matters, for 15 last years, I could follow lots of changes in programs, box, new comers and technology: from satellite to DTT, and live to VOD/catchup, it never stopped really to be a collective show, for a whole group. But social actions and networking is nothing but individual acts, as we don’t show us, linking others or chatting in a group session. More individual, because one-to-one action, talk and debate. As if whole family could stare at a member that would enter into networking…and being passive for hours. Dumb, no interest of course. I’m wondering how can be the result to come for the recent moves with manufacturers, that add contents or access to contents, to their TV devices (which already include set top box functions inside), as youtube, google browser and so long…I’ve been a witness for start of what we called interactive TV, which was a lab for “e-working or e-entertainent”, that took place in TV at the time and never been a real success…why? Because any individual act has nothing to see with “TV representation”, facing the family: what could be fun, to see someone making its shopping, boring the audience in the room…You see what I mean? What I can say, living with these strategics moves is that social networking is definitely an individual pleasure. how can anyone spend time, watching a private conversation, talk or chat without being active? Is that’s because skype is starting to collaborate with LG and Panasonic, on HDTV devices, that it makes the next big picture and makes it “social”. Not at all, it stays like a private conversation with a big screen video conference. I believe convergence has limits, in the way that technology grows faster than our agreement for. That’s not because tech can, that we want. And in the case of bringing social apps to TV screens, there’s a lot to bet in losing the essence of social: having a fresh private space of freedom and expression. Looking at youtube for my fav video doesn’t mean all the audience is gonna like it. Using Google on my TV screen will uncover my own research, as my own passions. That doesn’t mean it match with my surrounds. Are you ready to have a look at IM or your mails, in front of your whole family? Your bank accounts? At your private dates? I tried to resume as short as I could, the main schemas of using “screens”, with the targeted utilities. 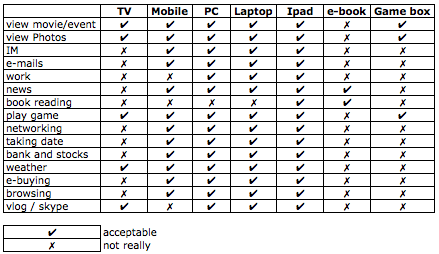 We see that nothing is obvious, even if we can call it “all screens” or “any device”, focusing on the way we can (must?) use these for. I don’t declare anything as “definite truth”, but put me in front of my experience of TV business development. As years passed, and saw such more and more “clever” ideas, there is limit to convergence, and these limits are social, not technical. For Heaven’s sake we still can control machines and make them what we really want them to do, for us. Let’s consider them as “tools” (as social apps are…), and use them. So social TV is more a concept than a screen, in fact. And last but not least, a “3D” concept: Deep, Disturbing and Desired. An easy way to bring new shape to old stuff. Let’s start your uncovered trip, to Social Screens Skip! Old TV set is out. Out of 20th century, he passed through revolutions (black&white, digital, HD, 3D…) and got some changes in uses, life and consideration. Started with information, public managed, it opened to others pleasure: entertainment, sports, discovering…Households then were completely hypnotized and caught in kind of dependance, like one said. And then this old device was hottin’, from ugliness to useless and energy consuming. At that time people was talking about “convergence”, the loneliness idea of a wired future, centralized, and started a competition in electronics manufacturers to invent this new TV device: THE screen. Where? How? but the screen. Then households turned their view to web audience…and naturally TV went to the web. People started to move, changed their social practices, became careless about the place and the moment…Mobile, mobility, then TV went to mobile. While this was going on, facts were there: TV is not the same anymore. And even if the contents were the same, we don’t want to consume them like we did. All the sector from media and television didn’t see the web wave (like lots of sectors anyway…), thought they had to change something…but what? when and how? for who? It quickly became the great riddle for TV value chain actors. Which contents to acquire, which rights, for what kind of usings, on which platforms and devices, and how long in terms of duration? Over for black Ford T, entering marketing and segmentation, need to make sense to believe that consumers are customers like other: because TV artifacts and rules have always been settled on fidelity, without any CRM management, and with the sole economic: audience = ads = buying intention. Brain available time for ads is not the same anymore, nor same profile and needs. Trying to put sense into an industry that started revolution after being involved into, I tried to build a working matrix, resuming how behaves now, reflexes about television consuming. You could be surprised but it is: it’s no talking or thinking about complexity, but really taking the influence of this new “market” of consuming TV. But where is my old housewive?…How does she can handle with such a purpose? That is, several ways of consuming television. And the real battle is not AGAINST other distribution channels, but WITH. Shaping the new landscape of TV means having imagination, beyond household. Where else, in the family, in mobility…? Fair enough, I can find my way because I can find A way of consuming MY TV. We do and everytime, watching television, not really much more than survey scores generally speaking, but IN A BETTER WAY. That means, we’re able to choose, learn and decide when and where, and for how much time. Famous framework about triple “A” theory (Anytime, Anywhere, Any device) is more than ever, a fact. and that changes the business. We’re not talking about HD or 3D, because it’s “only” quality enhancement, while others are “ways of life”, ways of consuming. Yes of course, according to CES now, where 3D is a star product, we can see that 3D in a certain point of view, can change vision of family entertainment, globalizing services – games, interactive, learning, art, museum experience…-. But changes are there and it’s not really a small pill for the business sector. It’s the “Rubik’s cube like” for television. Technology is already there, web is stepping like a giant (wiring, services, economy, networks), market is there too, with a huge demand on more and more services and self-learning, convergence and user’s centric functions. Maybe television has an amazing opportunity to catch some added consumers, by convergence and be the central “screen” for all household’s pleasures. My own network, whenever and wherever I want, is my concrete dream now and can be solved…we’re are at the threshold for new experiences. Social TV is taking off, with some events (Social TV Forum Europe), 3D revolution too with recent deals with ESPN, Disney’s, Discovery Channel, TLC, with CES, à Las Vegas…, and the next big event in London, on May. Old TV is alone, while everything has changed: but contents and pictures, needs and desires are really there, for a new entertainment world. Found an interesting source about new tv ideas…get here on agoramedia.